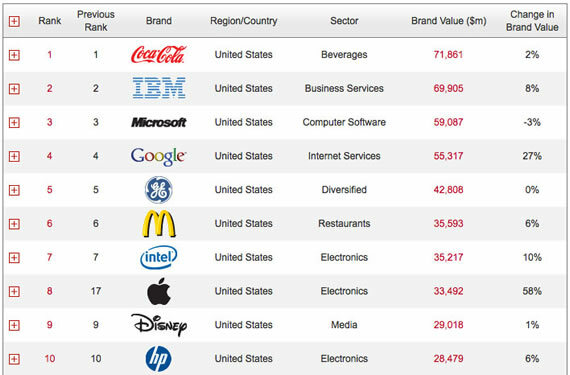 Recently the list of top 100 most valuable brands of 2011 has came out. Apple took 8th place in the top 100 list of valuable brand all around the world. Apple now joins in front of famous companies like Nokia, HP, and Samsung. In the last year 2011, Apple made remarkable growth on this list. In the year 2010, Apple ended on the 17th place. This list is updated and released every year. The company grew with 58 percent in the last year which is the largest growth on the list. Apple brand name has a value over 33 billion U.S. dollars. Google took 4th place on the list having 27 percent growth and a brand value of 55 billion U.S. dollars. Microsoft had 4% lost but takes third place.